It’s been over a month since I tried the Southern Hot Toddy at Alivia’s Durham Bistro, so don’t be surprised if it was just a passing winter’s fancy on their drink list. It was made with Jim Beam Bourbon, orange wedges, sugar, and hot herbal tea. Well, it was supposed to be made with those ingredients but the one I had definitely was not herbal tea—I think it was a Lipton black tea bag, if I remember correctly. That’s fine—I like black tea just fine—but it did make a difference in terms of expectations and quality. The flavors were nicely proportioned, however. The orange wedges were key to blending the bourbon taste in with the tea. Make sure you don’t let the tea steep too long, or those proportions will be thrown out of whack. 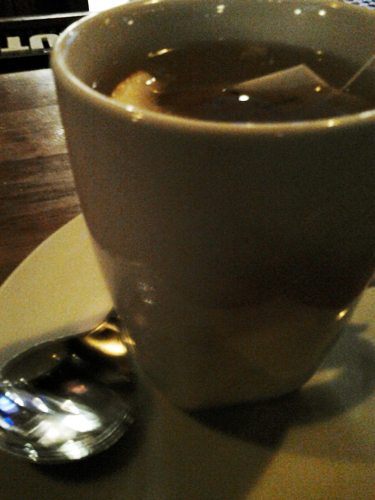 The Southern Hot Toddy wasn’t revelatory, but it was an interesting change and hit the spot that evening. If a better tea were used, I’d think of it much more highly.